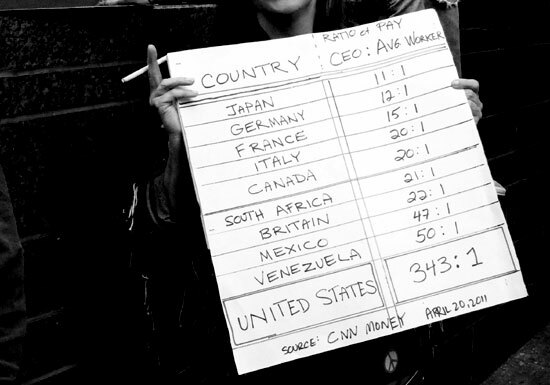 On October 15th Occupy Wall Street went world wide. Young activists decrying corporate greed and malfeasance had occupied Zuccotti Park near Wall Street for several weeks by then and were exhilarated by their success at warding off eviction by the Bloomberg Administration. The simple, yet sacrificial act of holding a piece of turf galvanized a movement and garnered support from all quarters of the globe. 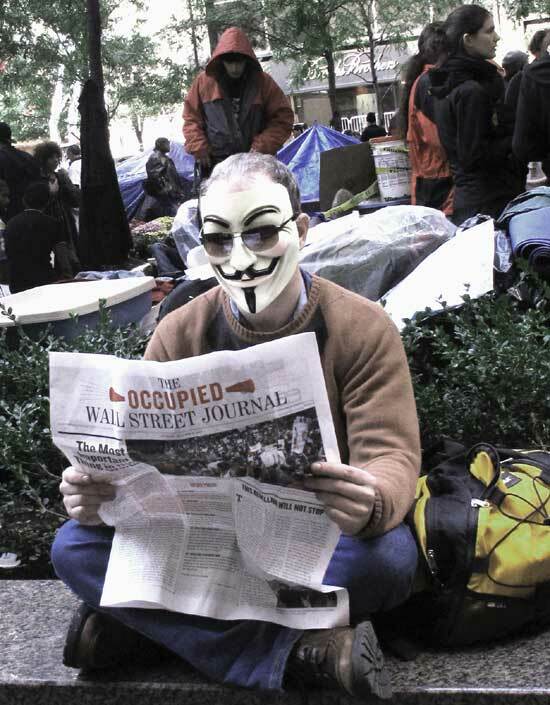 Taking their lead and strategic inspiration from the Arab Spring activists in Tunisia and Egypt the Occupy Wall Street Movement supplied the missing ingredient to the formula for social and economic justice that has evaded activists of the prior generation. Artist Organized Art’s MK Averill and activist and radio talk show host Elliot Tarry arrived in Zuccotti Park renamed Liberty Park by Occupy Wall Street (OWS) just after 1PM on Saturday October 15th to take part in the world wide day of protest and dialogue. Artist Organized Art (AOA) interviewed MK and Elliot upon their return. AOA: MK or Elliot or both, what made you go down to New York, to Wall Street, to join in the protest? MK: I felt a strong pull to set my feet firmly on the ground alongside the folks that had started this movement in solidarity with them, and I felt it was really important to stand there with them in their cause to right the imbalance of economic injustice in this country. At the same time I felt a little bit like a tourist going down for the day and I struggled with that. Taking the day off and moving myself to New York is not an easy feat for all kinds of reasons, family reasons and I wasn’t feeling very well that day, but it soon became clear that I did need to go and I really needed to be even a small part of the movement, at least for a day. I felt strongly that I needed to plant my feet on the same ground where these folks were fighting for economic justice in a country where things have really gone awry. Elliot: I have been an activist for years against the war and for social justice. I do a radio show that deals with those issues and I had been pulling back from demonstrations since years ago because it was clear that they were ignored and ineffective, but this particular movement and this occupation clearly had the ingredients that were necessary to create an awareness and to actually get something accomplished. So, I felt that I needed to be in solidarity with that movement and put my feet where my mouth has been in order to supply what they said they needed more than anything else, which was people and bodies. That’s why I went. It was the only chance I had to go down and it turned out to be the right day. MK: Something really striking about this movement is that unlike other protests, which set up a time and date, they’ve just placed themselves there and are using time on their side, there’s no rush, no urgency, it’s just a powerful statement. When I got down to Zuccotti Park I was expecting to see a lot of people there, and there were a lot of people there, but I quickly got a lay of the land, it’s a really small park and there weren’t that many people in charge running the place unless they were taking big shifts. The park was divided in two, the organizers, by and large young folks who had been sleeping there for a long time, opposite people that had kind of jumped onto the cause who didn’t seem as interested in it as they did in the free food and the scene. So, the park is quite small, yet there’s a lot of power coming out of that small space. AOA: I heard you were contacted by Nationalize Wall Street. What does nationalize Wall Street mean? 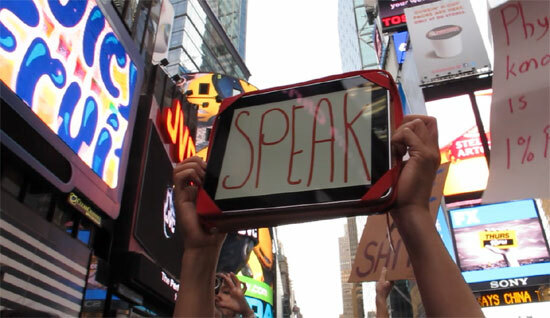 AOA: Is there a connection between the action at OWS, your presence and art making? MK: Just as Wall Street and corporate America have hijacked all the decisions around the distribution of wealth in this country and hijacked all the natural resources in the country and around the world for their profits, they’ve hijacked art in terms of drawing art into an economy of currency where it is only respected if it’s worth an amount a museum or a collector puts on it as a value. So I feel a strong tie, because artists, too, are feeling the drain of resources and the inequity. Elliot: I was impressed by MK’s photo. A man at the park, sitting reading the OWS paper. The publication is called OWS journal. He was wearing a Guy Fawkes mask and the photo seemed to capture exactly some unconscious connection between art mythos and the campaign for social justice. It captured the relevancy of political activism, without being didactic or ideological in form. The picture and his form captured the message. To me, part of the message was the importance of art and mythos, not just in the creation of an effective movement, but just as MK was saying, the corporations have captured or appropriated the art world and culture for their own purposes, for profit making purposes, and what the young people down at Zuccotti Park are saying, the energy they carry, is the energy of liberation from those shackles. That very same message is the message I believe Artist Organized Art (AOA) is carrying and that all artists should feel deep within their being to release themselves from the capture of the corporate monolith. AOA: Both of you took part in the demonstrations at Times Square later in the day. What were your impressions? MK: It was pretty awesome. We took a train up from the park because we were running late. The marchers were coming up Broadway from Washington Square Park to Times Square. At Times Square there were thousands and thousands of people. I didn’t really expect that number of them. I don’t think the police really expected that number of people. They seemed pretty organized in terms of the number of barricades, but it was mad, high energy, a kind of caffeine high of people chanting and yelling slogans, holding signs cheering sporadically and the solidarity was very strong. What was really impressive about that crowd was the diversity of ages and ethnicity. It was really powerful to be part of that and stand there with a group of people who all felt the same. Down at Liberty Park you get the sense that the movement is small, but being in Times Square it just grew a thousand fold. I’m not sure how many people were there, maybe ten thousand people. The police seemed agitated, yet some were kind. There were a number of arrests not far from where we were standing. Some police on horse back came in a threatening way and kind of riled up a group of people. When the crowd got riled I saw people sit down instead of getting into a frenzy with the police. Elliot: I’ve been to demonstrations in New York, much larger demonstrations, but there was a familiar flavor. All ages, all economic levels, all joined together with the drum beats and the street chants. The chant that dominated was “Banks got bailed out we got sold out. Banks got bailed out we got sold out.” Everybody resonated with that chant. When we finally were able to move into one of the areas that they allowed people to stand in, they had it all fenced off into different groups so the cross streets and the traffic could flow and we just happened to zip right into the area right in front of the ABC News ticker on the marquis of the ABC News building. The ABC camera unit was set up in the side street taking photos of the crowds. 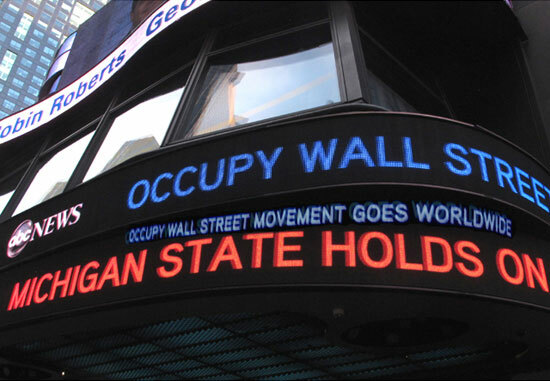 In large blue block letters on the ticker came the headline “Occupy Wall Street Goes World Wide” and a cheer just let out. A roar from the entire crowd spread like wild fire. It was really exhilarating and everybody could feel it and that the world was with us. That is a transcendent moment. My other impression was there were ten thousand people there. It was a being, a sort of a creature with twenty thousand eyes. Everywhere you looked somebody was holding up some kind of a camera taking pictures of other people taking pictures. Every angle, every square inch of its own being was photographed by some device or other whether it was video or photo. I found that to be a curiosity that I had never seen before at demonstrations. MK: Just to segue I would say there was a lot of art going on there in terms of people taking photographs and videos of there impressions. The creative signs were great. I think the most creative sign I saw was a woman who had an iPad. By hand she had drawn about 20 different slogans. She would periodically put up one of the slogans, then pull it down, go through her list and pick out another one, hold up her iPad. There was a lot of creativity going on there. People voicing and making a point. Elliot: The white and black Guy Fawkes mask connects not just to the idea of mime, but to the ancient art of masking and drama that, in this case, is symbolic. Its symbolism comes from a movie, an art form that, itself, was taken from comic books. The movie V For Vendetta was derived from a comic book series. The comic book author chose the Guy Fawkes mask as a symbol of resistance and of a resistance fighter, in the movie. That was in the comics and then in the movie, resistance against the Fascist State. So here we have art in the form of masking. Art in the form of comic book serial art. Art in the form of film. All directly impacting the mythos and the inspiration of a generation. A Movement. That is one of my key impressions that will last. MK: One really striking thing about being in times square is this movement that is railing against corporate America and the way business has been conducted in this country. People railing about the division between the 1% and the 99% in the middle of times square where the entire crowd is surrounded by huge, tall, giant, flashing billboards that just reek of corporate America and social control. The media that fills our brains with how we should be, or look, or act, or respond, or what we should like. Here was this movement that ended, up after a march, in the center of this and the juxtaposition of the crowd against these billboards was striking. Elliot: There is no question, Times Square, in and of itself, is a symbol of the excesses of consumerism to the point where “Giant-ism” is experienced. You walk in to an environment of video screens that tower over you from every angle and sky scrapers bombard you with images of consumerism in a way that demands your obeisance. Yet, here thousands of people were putting there wills and their spirits in opposition to that very energy of consumerism and conquest by corporate media. It was quite an impression to make on the media itself and on everyone there. Mary Averill (MK Averill) (maryaverillphotography.com) is a mother, artist and social worker based in Western, MA. She worked as photo editor for Christo and Jeanne-Claude ’s installation The Gates, Central Park, and won 1st place for the Lucie IPA Awards in 2005. Selected activities in 2010 are participation FestiwalStzuka 1 Documentacja, Lodz Poland, intermedia performance works at LAB in Western Mass, Emily Harvey Foundation NYC and Scandinavian Performance Festival, Live Action NYC. Appearances throughout 2011 on SWITCH, intermedia for public television out of Holyoke MA syndicated throughout Massachusetts. She is also the organizer of several international photographic workshops. Elliot Tarry is an anti-war and social justice activist and an inde-media radio producer with the Bread and Roses Show on WXOJ-lp 103.3 in Northampton, Massachusetts (BreadandRosesRadio.wordpress.com). Elliot is also a pagan ceremonialist and a proponent or what he calls the Sacred Earth Paradigm shift in consciousness. His essays on this and other subjects can be found on his website www.SacredEarthZone.com.